We urge you to intervene and stop the killing of Pakistan’s religious communities, including Sunni (Barelvi), Shia (including Hazara) and Ahmedi communities that are facing a virtual genocide simply for following their religious beliefs and practices. The recent attacks on the 12 Rabiul Awal processions in various cities around Pakistan (including Gujranwala, Mansehra, Gojar Khan, Mirpur, Khairpur and Karachi) are evidence of the menace of bigotry and intolerance. The government must act with all of its might to put a stop to this. It needs to be done NOW. The evil lurks in the belly of the so-called Diffa-e-Pakistan Council, a coalition comprising several ‘religious parties’ including some banned organsiations whose views dont resonate with the majority but are able to use their armed status and street power to attack others with impunity. The activities of this coalition need to be curtailed before it becomes the Destroy Pakistan Council. Many of those involved in the DPC are also active in the hate-campaign against the Ahmadiyya community. Most recently, hate-mongers have proposed the demolition of the Jamaat Ahmadiyya’s Aiwan e Tawheed building in Satellite Town Rawalpindi. 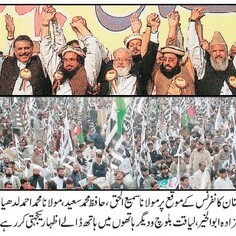 We express our disappointment at the participation of Pakistan Muslim League-Nawaz (PML-N) leaders in an anti-Ahmedi rally of Jan 29, 2012, attended by Member of Punjab Assembly Zia ullah Shah and traders union leader Sharjeel Mir (nominee for a PML-N ticket). It is also shocking that a leader of the traders community at this occasion made a threatening speech against the Ahmedi community. We strongly condemn these threats of violence, and urge the establishment of a code of ethics, across the board that prohibits any political party supporting those who victimize others. The Government, both at the Federal and Provincial levels, must take immediate action against violence, threats and intimidation, including those in the name of religion. A witness protection plan must be instituted and the police empowered, enabled and de-politicised to act against those who violate basic human rights in Pakistan. The full force of the law must be employed to ensure that no one attacks or threatens members of any community simply for following their religious beliefs and practices. Is it that Pakistan’s Hindus do not figure in the calculus or is it an omission that will be corrected? Before anyone says “including but not limited to” let me also say that list of minorities needs to begin with those having minimum religious intersect and then expand to include those with some intersect…else it will be one more loose stone in the foundations of the state. I believe the Hindu community in Pakistan is not being subjected to target killing the way the communities mentioned in the petition are, although in some areas they are certainly vulnerable to kidnapping for ransom, armed robberies, forced conversions etc. On another level, the general levels of violence and lawlessness affect all Pakistanis, regardless of their faith. Thanks for the reply. Yes, the context is slightly different as you mentioned. I hope the situation improves for all minorities in Pakistan in all aspects of life.